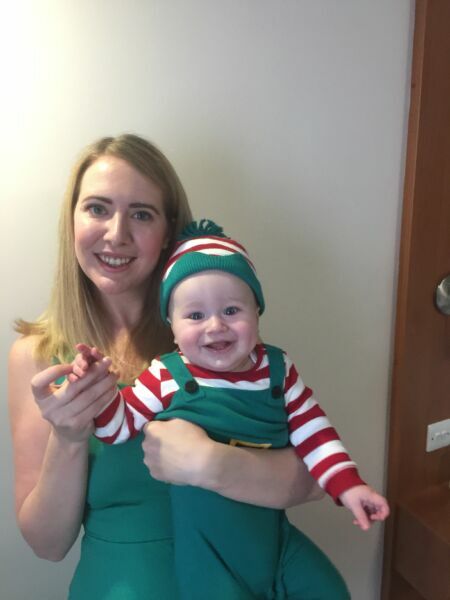 Mummy to Dex - 8 Month Update - Dexter James, how he's doing and what he's learnt. Dexter turned 8 months old on Friday. How? Why? HOW? My little darling has come on SO much over the past few weeks! Here’s what’s been happening. He has dropped a few bottles. It is so nice not to have to sterilise so many times per day. I remember the days when he was on seven or eight bottles. Thankfully he is now down to four. He has a bottle when he wakes at 8.30am, another at 11.30am, one at 3 or 4pm and a bedtime bottle at 7pm. It’s been amazing to drop the midnight dream feed. Although, this feed was a life saver to get him to sleep through, it was really hard some nights to stay up that late. I have a dreamy baby when it comes to sleeping. (Literally!) He wakes at 8.30am and is back down for a nap without a fuss at 10.30am. A second nap comes in at 2.30pm and he goes to bed for the night at 7pm, sleeping right through to the next morning. I am so thankful! For most naps he goes off without a peep. Gone are the days where I’d be in and out with a dummy multiple times. I have to say thanks to my Uncle Brian for buying us a wonderful Christmas gift. This fantastic product plays songs and lights up when baby wakes and cries a little and it soothes them back to sleep. Highly recommended! Dex is on three meals a day. For breakfast we have pancakes, toast, crumpets, shredded wheat and fruit. (But not all at the same time, although I have no doubt he’d give it a good go) For lunch it’s pancakes, baked potato, sandwiches or pasta; and for tea it’s a little bit of what we’re having whether that’s curry, pasta, stir fry or a burger. 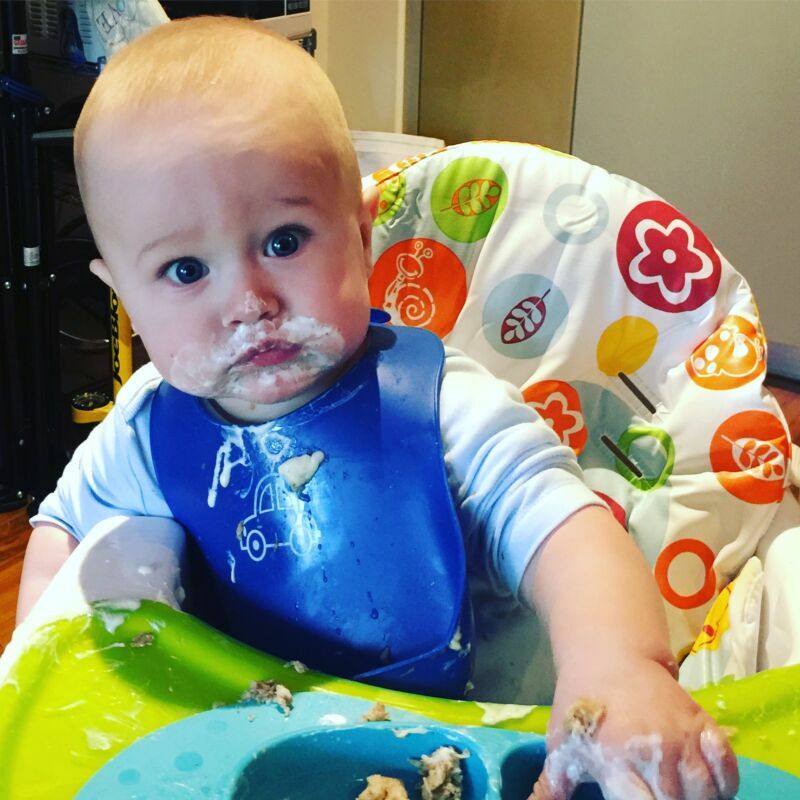 He’s doing great at baby led weaning. Gagging is very minimal and he is consuming ALOT. I don’t go to get him weighed officially because they stopped all the clinics within walking distance but I weigh him at home. He comes in at around 22lbs which looks to be on the 93rd percentile. I am not worried in the slightest though because he looks super skinny and he is REALLY tall. Like seriously, he’s wearing 9-12 month trousers and I had to put away a 9-12 month romper the other day because it was too small. I have the 12-18 month stuff on standby! Top wise he could squeeze into 3-6 but I put them all away to make room for the 6-9 and 9-12 stuff. Dexter is babbling away like mad now. He says mama, dada, nana and gaga. He doesn’t know what any of them mean though. He can sit unaided and can crawl. 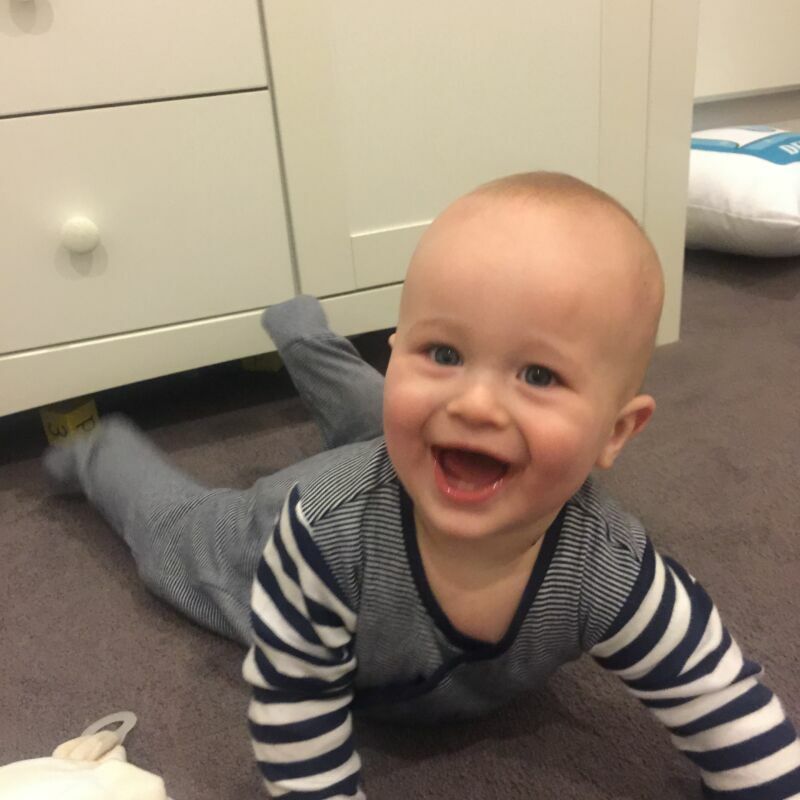 He is able to get from a crawling position to a seated position and can lift himself from the floor to a standing position if he has something to grab hold of. It’s scary. He crawls all over the house but he loves crawling to the oven to play with the oven glove and crawling around the bathroom. We’ve invested in some baby gates to stop him getting in the kitchen while I’m cooking. He loves bouncing in his jumperoo and playing with his wooden walker. He was given two gorgeous V-tech toys for Christmas that he adores as well. He still loves his old favourites like the Whoozit and foil blanket. He now has two teeth and I reckon one more on the way. He is so good at having his teeth brushed. I give him one toothbrush to chew while I scrub his teeth with another. He loves it. We sing the Brush Your Teeth song at the same time. I am so excited to see what the next month brings. He has developed his personality so much this month. You can really see him learning everyday, looking at things with interest and searching for Mummy and Daddy when he is scared. He makes me very proud every single day.